far and wide from Grove City. Did you always plan to be a jeweler? No, actually. I originally had athletic scholarships for college, but at the last minute, I changed my mind, got in my car, and drove to Los Angeles for gem school. I got a degree as a graduate gemologist, and I came back here and opened the store before I was 20. Pretty classic. What I’m wearing today is as dressed up as I get. What kind of jewelry do you wear? My favorite piece is a stickpin made from a watch case, and the diamonds hanging off of it are briolette cut, faceted football-shaped diamonds. They’re not common to modern jewelry. They give the stickpin constant motion, and it looks great on a simple black coat. How secure of an investment is jewelry? Some people in the jewelry business are having a tough time, but our business has been almost the opposite. People are saying, “I want to have something tangible to put in my hands that’s no longer paper.” The highest values come from antique and estate jewelry. That’s also where you will find some pieces that are truly unique, not just described as handmade. 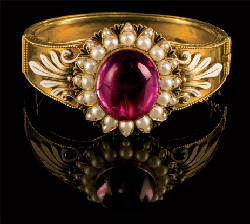 For example, we own a bracelet by Carlo Giuliano, who was Queen Victoria’s jeweler. It really is a priceless piece of jewelry; you will never see it again in your lifetime, it just doesn’t exist anyplace else. We also see a lot of very fine platinum art deco pieces that are still very desirable and fashionable; they were pieces for which a jeweler sat down, took a pencil and made a drawing, took the stones, and built the bracelet around the stones. Very little of that is going on today. Why aren’t we seeing more of that? We don’t have the people at this skill level, and there aren’t people training at this skill level. The people that we have in our shop, master bench jewelers, I trained, and I learned from my father, Adam Murawski, who was a renowned bench jeweler teaching jewelry making way back in the 1940s. Is it ever hard to part with certain pieces? No. My father taught me not to fall in love with the inventory. But, there are some pieces that are more difficult to part with than others. What is it like working with your son? We’ve been here for what is now going on 40 years, and I still like coming to work every day. My son, Jay, has made it even better. He is the best person I’ve ever known, and has played an integral role in the development of our company. He now heads our buying division and is a respected buyer and seller of diamonds and colored stones from Las Vegas to London. It’s great for me to know that we’re building something that will carry on. What advice do you have for purchasing something like an engagement ring? The average young woman says to us over and over again, “I don’t want a ring that looks like something everyone else has,” and also, “I don’t want anything so gaudy I’m going to get tired of it.” It sounds like it would be very easy to balance between those two issues, but it isn’t: To have something that has character but isn’t ordinary-looking requires real style and design. For young men, the first real desire is pleasing her with the ring, secondly is to get their money’s worth. Also, the size of the diamond has increased. When I started in business, we used to sell a lot of very small stones, and now the average sale is closer to two carats than one carat. Does that mean that people are spending more money? They’re spending a lot more money. And, the emotional part of the purchase has become more important than ever. 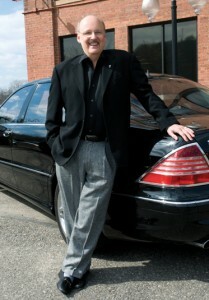 In Beverly Hills, I have six dealer accounts within a mile of the Beverly Wilshire Hotel, but in Mercer, Pa., about nine miles away from my store, I think that most people have no idea what we do. But being here is probably one of the single biggest advantages that we have over other people in the business because our costs are very nominal and it allows us to sell at a better price. Jeweler to the queen: Joden World Resources owns the world’s third largest collection of jewelry by Queen Victoria’s jeweler Carlo Giuliano; only London’s S.J. Phillips and the Victoria Albert Museum have more.